Yes, this is Salticus scenicus, the 'zebra spider'. It will be juvenile at this time of year. Thanks for record details. Thanks for the confirmation. is it normal for this spider to be hidden away in it's retreat during daylight, and then spend the hours of darkness out in the open in the middle of it's web ? I only ever see it at night, and during those night time hours it is always in the middle of the web and never out of sight ? Also I have just had a closer look, and have discovered that I have at least four of these spiders living in the same area, just for your information in case it makes a difference to your survey (Although I presume once they move in they would multiply and establish a colony). Dear David, yes this looks to be Steatoda nobilis, the spider which the media make such a fuss about. It has been frequent in the southern coastal counties of England for a great many years, without causing any problems and is also nowadays frequent in many areas of southern England. Where you found yours is a fairly typical location. Thanks for the location details. Confirmation of species for a newbie. Hi. This is my first time on the forum, so I hope I get the format right. 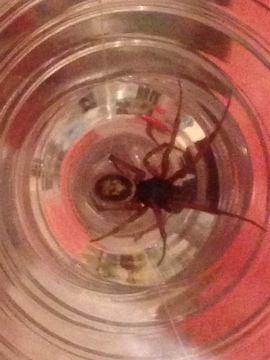 Can anyone confirm that this is a Noble False Widow please? It's currently living outside above my back door. I only ever see it out at night, and was wondering if this is normal. Photographed 27th August 2014 in Hayes, Middlesex. Postcode UB4 8EH. 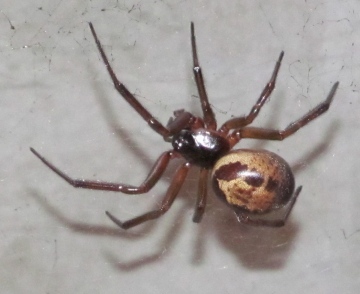 This looks to be Steatoda nobilis, the spider which the media make such an unjustified fuss about. It has been frequent in the southern coastal counties of England for a very great many years without causing any problems and is nowadays frequent in many areas of southern England. The media frenzy caused by this spider is unwarranted. They are unobtrusive, have no interest in attacking humans and would only bite if they were put into a position where they do so as a defensive reaction. Honey bees and social wasps pose a far greater risk. I found this in my bathroom. I've never seen one of these in the house it was about the size of a 50p and had striking red/orange legs. Once I caught it I noticed the beautiful striking marking on the abdomen.